Take the B6047 South from Melton Mowbray, passing across the Melton Airfield, and through Great Dalby, Thorpe Satchville and Twyford. Drive out of Twyford up the Tilton Road for approx 500m. You will see the entrance to Holland's Nurseries on the right hand side. Take the B6047 North, drive through Tilton on the Hill and continue towards Twyford. As you pass Thimble Hall on the corner of the Queniborough Road and Tilton Road, Holland's Nurseries is on the left hand side. The entrance is just prior to the brow of the hill, opposite the white house "The Upland's" which is on the right. Pass through the village of Queniborough and take the South Croxton Road towards Twyford. 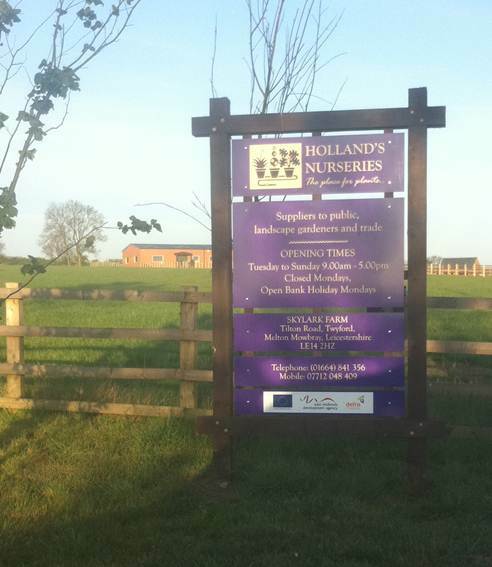 Stay on this road until you reach Thimble Hall, you will see the Holland's Nurseries sign. Turn left on to the Tilton Road and drive down the hill towards Twyford. The entrance is just prior to the brow of the hill, opposite the white house "The Upland's" which is on the right.